Hair extensions are an incredibly useful way to change your look. Not enough people really understand the ins and outs of choosing the right extensions though, so we decided to get an education from our resident expert. We sat down with our specialist, Leah, to talk about the long and short of getting the perfect hair extensions. Here are Leah’s top tips for looking amazing with hair extensions. It’s a common misconception that people only get hair extensions in order to make their hair longer. In fact, extensions are commonly used for fashion styling. Certain looks and styles are only possible with extensions to provide the necessary volume. If you want to add highlights it is possible to do it entirely with carefully selected extensions, without risking the potential side effects of using colouring dyes. For ladies (or gents for that matter) advancing years or illness can take their toll on the thickness and volume of one’s hair. In the hands of a specialist, hair extensions can restore your crowning glory and look completely natural. Extensions can create a great deal of volume and weight to your hairstyle, and because extensions are made from real hair, it can feel completely natural. 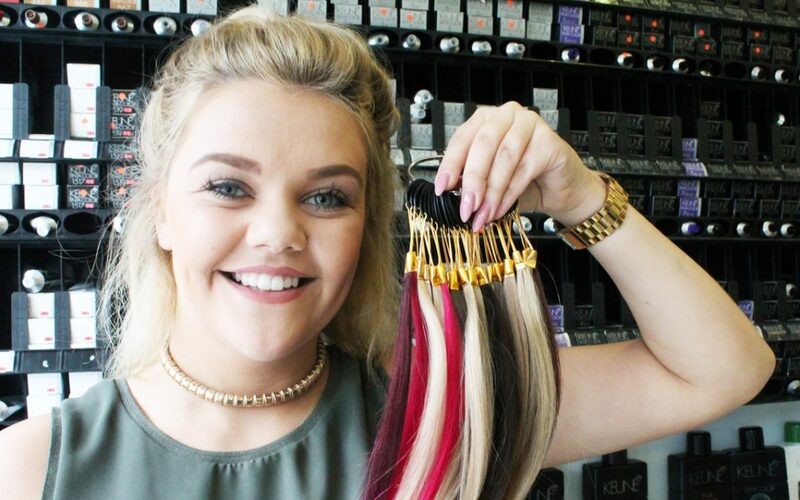 Leah uses a hair ring (imagine an oversized key ring with many tiny “pony tails” of different colours hanging from it) to ensure that she chooses extensions which perfectly complement her clients’ shades of hair. Regular clients know it’s not a process that you should rush. Initial consultations can take a while, as colour matching can be an in-depth process. The actual process of applying the extensions can take anything up to 3 to 4 hours. Many of Leah’s clients take advantage of The Cutting Garden’s free wi-fi during their appointment and spend some quality time with their iPads and laptops. She’s even had student clients writing essays while she’s working on their hair. One of the reasons why it can take so long is because of our stylists’ painstaking efforts to make sure the extensions blend in seamlessly with your own hair. This isn’t just down to colour, either. After the extensions are applied, they are cut and styled to blend in with your style. To the untrained eye, the process is entirely invisible, but the effects are stunning. As our conversation moved onto the actual technique of attaching the extensions, Leah became even more animated. It was clear that this was a subject that she knows a lot about. To bead or not to bead? “Lots of salons use a kind of glue to attach their extensions,” she explained. “At The Cutting Garden I use the newest technique and it doesn’t use any glue at all. Look at this.” Leah reaches into her bag and produces a small plastic container filled with a mass of incredibly tiny plastic beads each about the size of a pinhead. These tiny beads are how the extensions are attached to the client’s hair. Leah explains that these micro beads provide the smallest attachment method currently available on the market. No glue, tape, or chemicals are required, which means there is much less chance of damaging your hair. In addition, they can be detached, the extensions retrieved and re-applied. Hair extensions can remain attached for up to three months; for the best results you should have them removed and re-applied every two to three months. This way, you can ensure they keep looking great and also last as long as possible. Extensions are a relatively low maintenance product so long a you take a few basic precautions. Don’t be too rough with them, use a product to keep them hydrated. 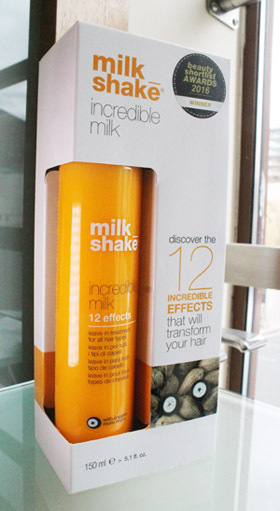 Leah advises using milk shake (no, not the stuff you get from MacDonalds) which is a protective cream-based treatment available from the salon that protects your hair in 12 different ways. Tie your hair into a loose plait before bed, and you should also avoid applying too much heat when drying your hair. If you look after your extensions they should last around 9 months, perhaps longer. Leah joined The Cutting Garden from school, completing her apprenticeship and night school training to attain levels two and three. Since joining us, Leah has quickly built an enthusiastic following and is always keen to discuss what clients need and advise them on hair extensions, colour changes, and style. Leah works on Monday, Tuesday, Thursday, Friday and Saturday. You can try The Cutting Garden yourself. See how our experienced stylists look after your crowning glory. Simply call 01752 223233 or book an appointment online. The Cutting Garden is known in Plymouth for great styling, friendly customer care and superb quality. For over 30 years it has been known as one of Plymouth’s most popular ladies' and gentlemen’s hair salons. Book an appointment and treat yourself to great hair and outstanding care. We provide FREE WIFI in the salon for our clients.